It's been a little while since I did a little Lush post isn't it? With the Valentine's range on the shelves and the Spring products on the way I'm getting a little more excited about what Lush has up their sleeve. Christmas bits are great, but I get a sick of the clove, cinnamon (pine? Christmas cake...?!) scents very quickly. I really like their fresh, sweet and floral scents so these are more my bag! Last year I loved the Lush Valentines bits and pieces and I'm loving the look of the range so far. Now I say 'so far' as I have only had a look online. The 2 products I have were kindly picked up by my wonderful fiancé so he is in the good books at the moment. He knows I am a fan of the Unicorn Horn Bubble Bar (£4.50), it's one of the products I stock up on. It's such a sweet and calming scent. The Ylang Ylang oil and Lavender is really soothing, I always feel great after a bath using one of these. I tend to break mine in half and use it for two separate baths because I am cheap thrifty. 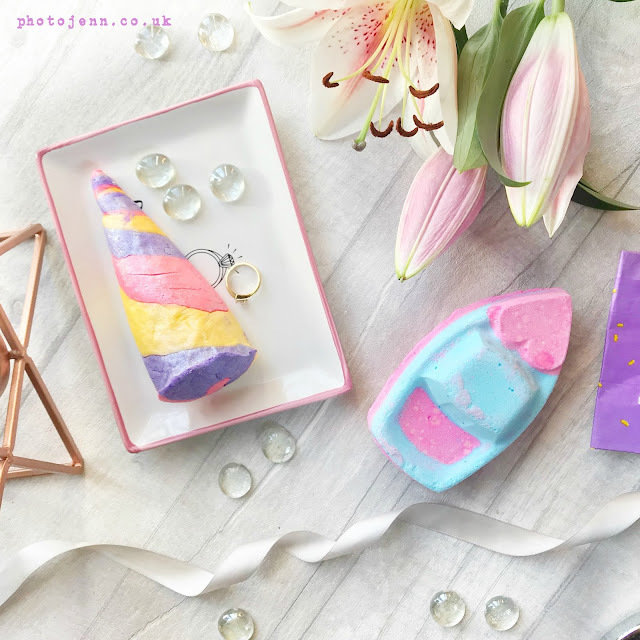 “Neroli oil increases serotonin levels in the brain which makes us feel contented and cheery, so you can ponder the existence of magical creatures while building a fairytale landscape of feel-good, fragrant bubbles” …don’t mind if I do. 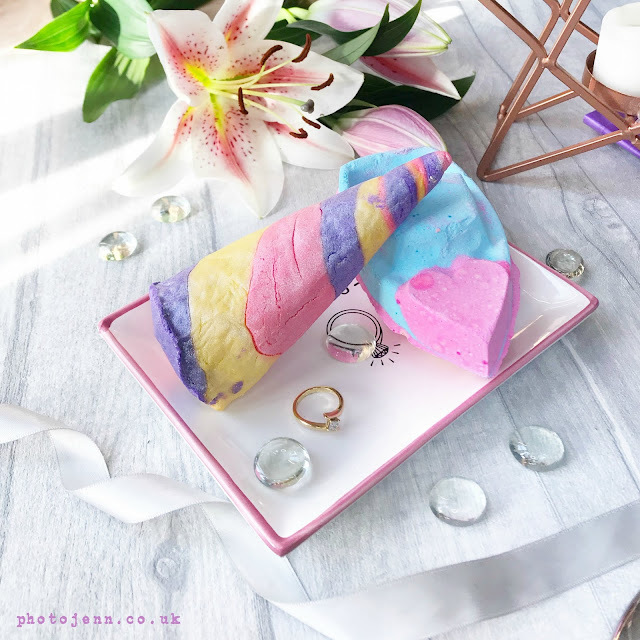 The Love Boat bath bomb (£4.25) is a new one for this year and boy is it CUTE! The little heart on the front and the colours... just... yes! I popped this in the bath the other night and it fizzed about beautifully leaving trails of pink, blue and yellow which leaves the bath a lovely lilac. The scent of Sicilian lemon oil, sweet orange oil androse oil filled the bathroom and left the skin smelling gorgeous. Definitely one to pick up as a Valentines treat (for yourself!). I'm looking forward to taking a closer look at the rest of the range, I'd love you hear your Lush recommendations. For videos when I use the products keep up to date over on my Insta Stories.